Xeno is the Latin word for strange; foreign; different:We are all different. But we can choose to create a path to better understanding of who we are and live our best life! Recover all the power of your authenticity, which is who you really are when you are born. Step out of your comfort zone to seek truth and discover yourself. 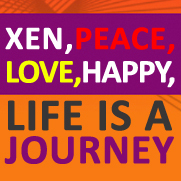 Celebrate the Xen In Everyone!